Aloe vera is a cactus-like succulent plant with thick, fleshy leaves. The aloe family probably originated in Africa, but they have been cultivated all over the world for centuries. The leaves contain two different substances that have long been used for medicinal purposes. The first is a transparent gel-like substance commonly used as an ointment. The second is the inner part of the leaf surrounding this gel, which contains a yellowish compound called aloe latex. The gel from aloe vera leaves has been used for thousands of years to treat wounds, skin infections, burns, and numerous other skin conditions. More recently, there is promising research in both animal and human studies that topical aloe gel has immune-balancing properties that improves skin inflammation. Aloe vera was known to the Egyptians more than 6,000 years ago as the “plant of immortality,” and Cleopatra reportedly used it to improve the beauty of her skin. The ancient Greeks thought of aloe as a “miracle health plant,” and Alexander the Great is said to have conquered certain territories specifically to secure control of the plant. It is thought that the moisturizing emollient and healing properties of aloe are due in part to its polysaccharides—long-chain carbohydrates such as aloeride and acemannan—as well as numerous powerful antioxidants. These work together to exhibit the immune-boosting, antiviral, and healing effects that become so evident when you apply aloe to your skin. 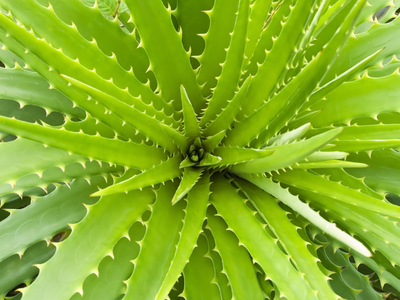 Aloe vera may also be the most important plant ever discovered for digestive health. Odds are high that you or a member of your family suffers from some sort of digestive disorder. The numbers describe a real crisis of modern living: More than 60 million North Americans suffer from frequent heartburn, 15 million experience it daily, 25 million have been treated for ulcers at some point in their life, and more than 30 million qualify for the diagnosis of irritable bowel syndrome. The dried latex has long been taken orally as a laxative. Aloe vera juice also contains a natural acid buffer called calcium malate (also known as malic acid). Drinking homegrown aloe juice will not only reduce the acid in your stomach immediately, but it will continue over time to buffer the hydrochloric acid your stomach produces and heal any tissue damaged by acid erosion due to heartburn and gastroesophageal reflux disease (GERD).